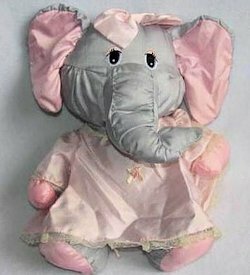 I’m looking for a grey Potpourri Press Puffalump elephant girl with a pink dress and pink bow. It was made in 1987 and only sold for a few years. My daughter loved this toy (she named her Ellie) and took it everywhere with her. Sadly, her dad threw it away after we divorced. I would love to have Ellie for my brand new granddaughter, Kailie. Please help me find this beloved stuffed animal for my granddaughter. Beware, there is a scammer on ebay trying to sell counterfeit Potpourri Press Elephants.